Spring M&M Cookies are the softest, most buttery cookies you will ever try. All thanks to this one special ingredient! Who knew? 1. In a large bowl, combine the butter, sugars, egg, and vanilla. Beat with a hand mixer for 7 minutes (or 5 minutes with a stand mixer and paddle attachment). 2. Add the flour, cornstarch, baking soda, salt and mix until just combined, about 1 minute. 3. Fold in the milk chocolate M&Ms. Grab a large plate and using a medium 2” cookie scoop, form mounds onto the plate. Flatten the mounds slightly with your palm. 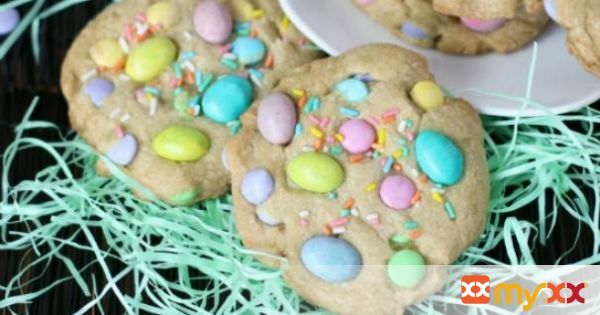 Sprinkle the pastel sprinkles on top and if you are also using the M&M eggs, place a couple on each cookie top. 4. Cover the cookie sheet with plastic wrap. Refrigerate for 2 hours (or up to 5 days). If you don’t refrigerate them, the warm dough will spread out like crazy. 5. When you are ready to bake, take the cookies out of the refrigerator for 15 minutes while you preheat the oven to 350°F and line a cookie sheet with a Silpat non-stick baking mat or spray with non-stick cooking spray. Place the cookies 2 inches apart (8 cookies per sheet) and bake for 8 minutes or until the edges have set and the tops are just beginning to set (they may still look pale and glossy in the center). Do not over bake. Allow cookies to cool on the cookie sheet for 5 minutes before transferring to a cooling rack. Enjoy!